with the art world so sleepy, if not downright totally dismissable – at least if you’re dependent on the gallery scene !! movies are your best bet this month. MIDNIGHT IN PARIS is sweet and goes down very charmingly. OWEN WILSON might make you miss that ole codger WOODY, in the prime of his nebbisha youth, but wisely he was allowed to bring his own brand of slow (and, thankfully underplayed) comedic pace to the role. 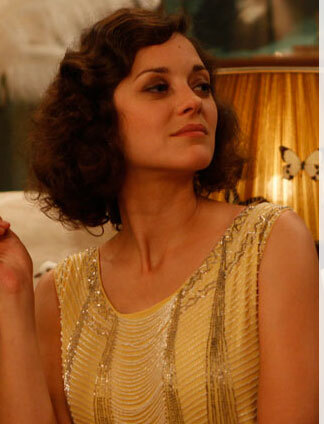 But the undeniable star of the show is French actress MARION COTILLARD. Unbelievable magnetic. She’s worth the price of admission alone, and will want you buying the DVD . . . . her portrayal here, of the ‘ultimate art groupie’ is – that timeless and captivating. Every time she appears on the screen, your heart skips a beat. Her costumes are also worth a mention. and I bet they have some impact in fashion – going forward. slouchy flapper style dresses, with minimum fuss – that just skim her figure beautifully – with a music all their own. a thin band of navy blue light-reflecting sequins on one neckline, a shiny yellow satin ribbon on the delicate sailor-style neckline of another. from an artisan’s point of view – just beautiful. The worst part of the movie was their big kiss. although the chemistry between the two time travelers – heats up nicely – the actual ‘big’ kiss is the worst edit ever, as we get subjected to those mandatory huge ‘open-your-mouth’ close-ups . . . that feel more like we are watching steam shovels in motion than anything else . . ugh. the official trailer is a dud and doesn’t capture any of the movie’s considerable magic. the film’s actual opening montage of the city – PARIS – aka THE CITY OF LIGHTS – is a photographic & editing knock-out, just drop dead, I wana be there – awesome. and they should have just had a leap of faith – and used that. It was amusing to see CARLA BRUNI – a face that could launch a thousand magazine covers. ADRIEN BRODY was mad wild as D-A-L-I !! the other famous characters came to life – kinda hit or miss – but in a huge fun way. kinda like choosing from a box of elaborate chocolates. you might not like the jelly center, but the chocolate shell was delish . . . I liked the TOULOUSE DE LAUTREC cameo, the best. no wait, I liked the COLE PORTER portrait – the best !! which comes closer to the beginning of the movie – and sets the tone for the entire evening of Parisian fantasy. the Cole Porter soundtrack was as dreamy as hell. and yeah, I liked the guy who played PICASSO, too. that nutshell portrait rang really true, stranglely enough. the one that got under my skin the most was ERNEST HEMINGWAY. But what do I know ? the blustery presentation had the more literary types in the audience around me, hooting out loud in appreciation – every time he made the scene.